I haven't posted about my College Program at all since my training. My program ended on January 5th and now I'm on a short break before I start my Professional Internship (more on that later). Now that I've finished with the role, I figured I'd give any new VPCPs (that's vacation planner college program-ers) some info and tips about their new role. Look at how much fun we're having! Vacation Planning rocks! Probably your first concern is the job itself. Vacation planner is basically a fancy way to say ticket seller. You will be located at the Ticket and Transportation Center or the main entrance of Epcot, Hollywood Studios, or Animal Kingdom. Every day, you get an update on what's happening that day, get your till fund, and head out into the booths. In the ticket booths, you will help Guests decide which tickets to buy, pick up will calls, and fix ticket issues. You will have a home park, but you can pick up shifts at any of the four theme parks. Depending on special events and expected crowds, you may be sent to another park. You will also be trained as a greeter--the CM who stands in front of the vacation planning booths to help Guests and answer questions--and may be scheduled for greeter shifts. At the TTC, vacation planners are also trained in Parade Audience Control, or PAC, and will be sent to the Magic Kingdom some days to help with the parades. You will also be trained in "squeegee", when you help clear the area of water before the TTC opens to Guests. This holiday season, all of the CPs were trained to use iPads to sell tickets and fulfill will calls, but I'm not sure if they'll continue doing that. 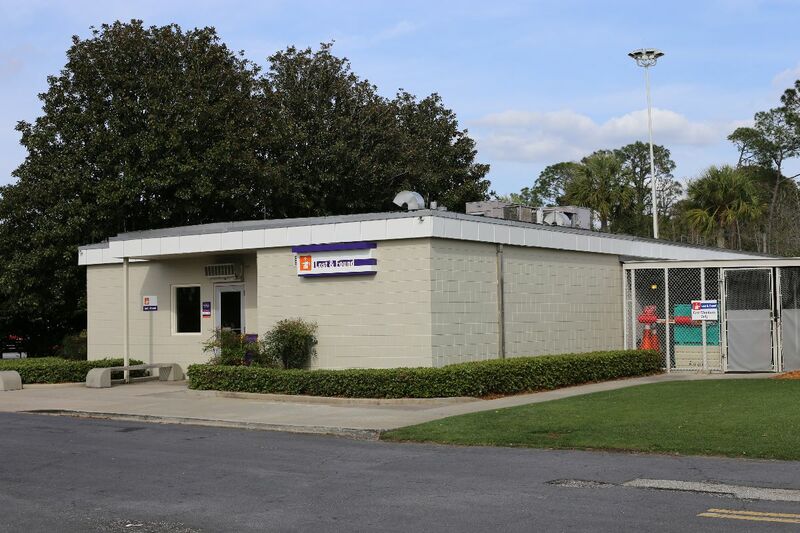 The Transportation and Ticket Center was a great place to work. The location had the highest volume of Guests. I picked up shifts at other parks and I was often bored there waiting for Guests to arrive. I preferred the faster pace at the TTC. The costuming building is located right at the parking lot, and parking is much easier than at the theme parks. The earliest shift I ever had started at 6:00 AM and the latest shift went until 9:00 PM. From what I've seen, these are the most "normal" hours for any College Program role. As a rule, CPs get the worst shifts. So if you're working in a resort, which operates 24/7, you'll likely be getting overnight shift. And guess who has to stay at Magic Kingdom all night when Extra Magic Hours last until 3:00 AM? Vacation planners are only scheduled for when the ticket windows are open, and they only open slightly earlier than park opening and close well before park close. There's a downside, however: you may have fewer hours available to work. During my program, I was rarely scheduled more than the minimum 30 hours a week. During the less busy times of the year, there were a lot of vacation planners desperate to pick up extra hours. Magic Kingdom vacation planners, since they are PAC-trained, can pick up non-vacation planning PAC shifts for some extra (often overtime) hours. You're able to switch shifts, give away shifts, and pick up other VPs' shifts. This is mostly organized through a dedicated Facebook group. Since vacation planning is a sales position, incentives are offered for your sales. If you sell good tickets, you can select rewards such as gift cards, resort stays, and electronics. It's one of the first thing you'll hear vacation planners talking about, and some people stress out about it a lot. In my experience, though, it was not difficult to meet the goals as long as you followed the sales tips. I got a reward every month without much stress. Other contests are held throughout the year depending on what the sales focus is. I won Target gift cards, Publix gift cards, movie tickets, and a Memory Maker through these contests. We were also given free tickets to Mickey's Not-So-Scary Halloween Party and Mickey's Very Merry Christmas Party so we could better sell it to Guests. The vacation planner role opens the door to Professional Internship roles. Some roles, such as College Program Alumni Only Ticketing Internships, require or highly recommend experience with Disney's ticketing system. The sales experience is also great for marketing and sales positions. Many of my fellow CPs in vacation planning got Professional Internships. Vacation planning is a small group; there were only about 80 vacation planners at the TTC, and TTC is the location with the most vacation planners. There were only 14 CPs at the TTC during my program. I knew virtually every vacation planner by name and was able to make great friends. Like every workplace, there are some people who are overly competitive or unfriendly, but overall vacation planning is a family. My managers and coworkers were all amazing. I will definitely miss being a vacation planner and could not have picked a better position for my College Program. Congrats to any future vacation planners and congrats on getting the best role in the program! If you have any questions, feel free to comment below. 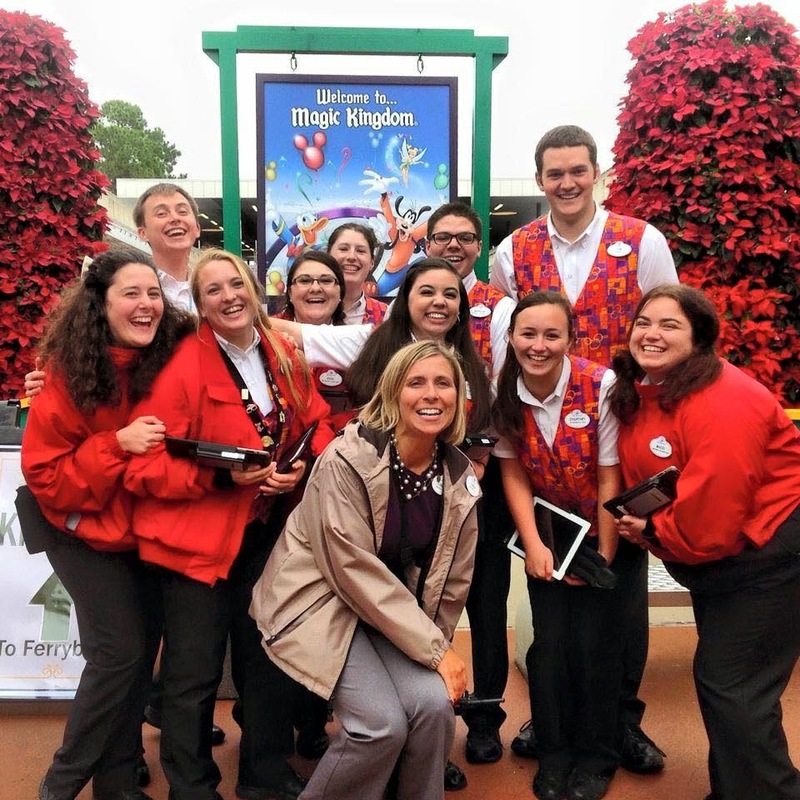 Dedicated blog readers may recall Erin Foster’s article “Spring Break at Disney World – Teens’ First No-Parent Trip,” outlining her teen daughter and friends’ first Disney trip without parents. Though now I’m (supposedly) a real adult—I just graduated in May–it wasn’t long ago that I was a teen taking my first Disney trip without parents. 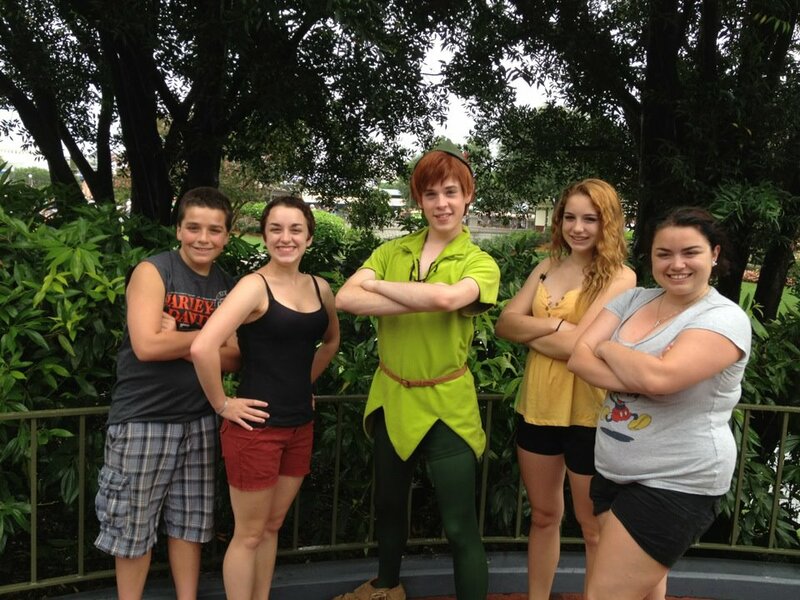 My first winter break in college, I went to Walt Disney World with my boyfriend and two other friends. Two years later, I went for my 21st birthday with my three younger siblings. So for any teens or young adults out there planning your first parent-free trip, here’s a quick guide into your first clumsy steps into Disney adulthood. Peter Pan may never grow up, but my siblings and I had to for our first Disney trip without parents. Why a Disney Trip Without Parents? Walt Disney World is the safest place to go for your first no-parent trip. The crime rate is essentially zero and every single cast member is trained to help you stay safe. It’s also one of the best options for fun. All through college, I never found the MTV Spring Break-style college trip terribly appealing. I enjoy the occasional beverage, but I can only “WOOOO!” for a few hours before I’m bored. Walt Disney World has an infinite number of activities and it’s impossible to get bored. I had been planning my family’s trips for years, so I felt comfortable planning my own trip. Due to our genetic similarities and shared upbringing, my siblings and I know each other quite well and knew we would get along during our trip. We are all Disney experts who have similar interests and goals for a Walt Disney World trip, and a unanimous acknowledgment of me as the leader. When I went with my friends and boyfriend, they all knew I was the resident Disney expert and were happy to follow my plans. I had been friends with all of them since the third grade, and my boyfriend and I had been together for over two years, so we were confident in our ability to deal with each other for a few days. Their most important quality was their enthusiasm for Disney fun. You’re going to need at least one person to be 18 or older by the first day of your trip. No hotel, on or off Disney property, will let somebody younger than 18 check in without an adult. Many off-property hotels have a minimum check-in age of 21, but Disney’s age limit is only 18. If you’re looking to rent a car for your trip, Fox Rent-A-Car will allow drivers 19 or older to rent a car. Drivers under 25 are charged $14.00 per day on top of the base rental price. You can also use a debit card to pay for the car rental as long as you have the full rental charges, plus $150, available in your account. Since Walt Disney World is a family park, nearly all locations are open to all ages. The only locations that require you to be 21 or older to visit are Jellyrolls and Atlantic Dance Hall, both located on Disney’s Boardwalk. Any other locations will allow those under 21 to enter, though there may be restrictions about sitting at the bar areas. When you’re the actual adult in the group, you’re going to need to have actual adult things with you that you may not have thought about with your parents taking care of everything. We all know college students have no money, and I was (read: am) no exception. So we took severe lengths to save money on our trips. Pack food. We took full advantage of Southwest’s free luggage policy to bring giant suitcases filled with peanut butter and jelly sandwich ingredients, canned foods, cereal bars, and any other food we could fit. We had the occasional dinner out and bought some snacks, but we saved tons of money on meals by packing lunch for days at the parks. Arrive early and leave late. With just three nights in a hotel, we had four full days in the parks by arriving on the earliest possible flight, dropping off luggage, and heading straight to the parks on the first day. On the last day, we dropped off our luggage at bell services, went to the parks, and took the latest possible flight home. Was Walt Disney World your first trip without parents? How did it go? What advice do you have for first timers? Let us know in the comments. Over the next couple of days, I had my operations orientation and Magic Kingdom orientation. The operations orientation--"Welcome to Operations"--was a lot of learning at Disney University, including a lot of safety information and details about the different roles involved in operations. What impressed me most was the training about guests with disabilities. Every single cast member is trained how to appropriately interact with and support guests with disabilities and there are so many services available to give guests with disabilities the best possible experience. The Magic Kingdom orientation--"Once Upon a Time...is Now"--was a walk-through of Magic Kingdom, where we got a brief descriptions of every shop, restaurant, and attraction in each land and how they tie into the story of the parks and land. We got to ride on Haunted Mansion, which was great because I hadn't gone on any attractions since starting here--I haven't had a day off since getting access to the parks. The coolest thing was being in Magic Kingdom before the park opened; I've never seen it that empty. After park orientation, we met up with a greeter who brought my fellow vacation planners and me on an overview of the TTC. We traveled via ferry, so I got an in-person look at the DVC construction on the Polynesian beaches. We picked up our costumes, which are not super flattering, but it's pretty sweet that we don't have to worry about sweating or rain or anything--air conditioned booths, baby! After a brief adventure trying to find my car in the parking lot, my fellow vacation planners and I went to check out the discount stores available for cast members. Tomorrow I have a day off, which I plan on spending in Epcot with my friends from training. Monday, more classroom training! I'm usually on top of deadlines. Every semester of college, I logged onto course registration the second it opened with my perfect schedule already planned. However, I decided last-minute to try out a course through the College Program. There are three kinds of courses through the College Program. The first is the collegiate series. These are college-level courses that you could get three credits for through your university (hopefully). These are graded pass-fail and involve assignments, exams, etc. The Disney Exploration series are seminars where you learn more about some aspect of the Disney company through site visits and guest speakers. These are not graded. Professional Development Studies are more technical training classes for subjects like finance and engineering. I registered for Advanced Studies in Hospitality Management, a collegiate series course, both because it was one of the few classes available and because I never studied hospitality in college and wanted to learn more about it. The course was $10 for course materials. When I told my CP alum-roommate this, she looked at me like I was nuts. Why would I take a collegiate class when I had already graduated and wasn't getting any credit for it? But I thought I should at least give it a shot. You're allowed to drop a class with a full refund after the first week. I headed over to Patterson Court Classroom 8. I was able to enter the complex by explaining I had class and showing my CP ID. The classrooms were in a building on the right side of the complex with signs pointing the way. In the classroom, there were tables with Disney Internship binders in the middle. The binders included notebook paper for taking notes. The teacher's name was Pamela, who was both intelligent and funny. However, after hearing about the class content, I realized the class was not as specialized in hospitality as I was hoping and was more of a general business class. During the class break, I talked to Pamela and she agreed that the class wasn't right for me. I've decided I'll be taking a Disney Exploration Series class during the fall. It was worth a shot and I was glad to meet Pamela. Now it's off to bed for Traditions bright and early. A few days before my check-in date, I got an email from the DORMS system reminding me to print out my on-boarding documents and to bring my I9 form documentation (passport, driver's license, birth certificate, etc). It may also list an arrival time. My email specified to arrive 9am-10am. I decided to arrive at 9:30am, figuring most people will have cleared out by then since I couldn't get there when it first opened. I was asked for my arrival time when I drove onto property, so you may be turned away if you arrive too early. Upon arrival, you'll be handed a program guide, which is a combination day planner and guidebook to housing, working, etc. Keep it out through the whole process. The first stop after receiving our program guide was to get a little sticker on the back page which lists your job and location. The attractions people had their location listed as the land where they'll be working. 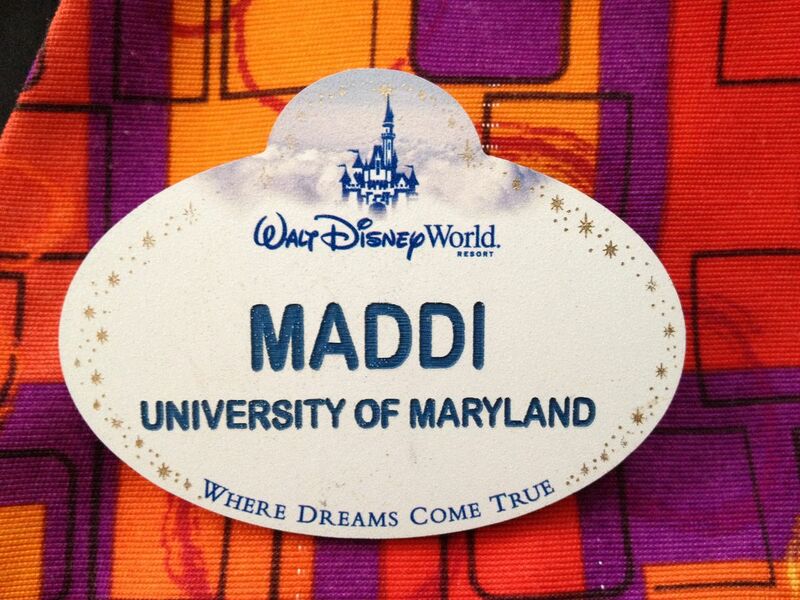 For example, my line-mate was attractions in Hollywood Studios on Sunset Boulevard. So while she knows the general area of where she'll be working, she doesn't know if she'll be at Rock 'n' Roller Coaster, Tower of Terror, Beauty and the Beast, or Fantasmic. The dining people also seemed to get a general location instead of a specific restaurant. Luckily for me, there's only one location in each park for vacation planners. Even more luckily, I will be located at Magic Kingdom! The next stop was a station where I was asked to hand over my driver's license. I'm not sure what they actually did at that station, but I was told to bypass the line for housing assignments since I would be living off-property. I was directed to a photo booth to take my picture and an ID card was printed out a few minutes later. At the next station, I was handed a College Program Arrival Itinerary. It listed the time I needed to arrive at casting, the time of my drug test (I didn't need to take one), the time of my housing welcome session (also not needed), and the time for my language testing (didn't need that either). It also included an info sheet about my Summer 2 course registration. I'm currently enrolled in Advanced Studies in Hospitality Management, but I may drop the class after the first session. I'll wait and see if I like it. The next station went through the aforementioned itinerary and briefly explained each item and allowed time for questions. I asked if I was required to attend the housing info session and was told no, but other CPs heard differently. The next station had a speaker from the Disney Education program to talk about classes and another station had info about safety. Not much notable there. By 11:15, I was done the whole process--much less time than the 4 hours I've heard from others. Not sure how much was my timing and how much was the increased efficiency of having more forms online. Regardless, I had almost 3 hours to kill before my 2:00pm appointment at casting. This time would have been useful if I was unpacking and moving into a new apartment, but since I wasn't moving in, I found another buddy who would be staying off-site and we decided to drive over to Downtown Disney and grab lunch. But first, we stopped by to do her drug test. The drug testing was located in an apartment in Vista Way. Drug testing is required for roles that deal with guest safety, so lifeguards, attractions, and anyone who would be driving a vehicle needed to get a drug test. I was allowed to accompany her to the test and wait in the common room area. My friend was instructed to fill out a short form and wait to be called. Water was available in the waiting area to hydrate before the test. The whole process took less than 20 minutes, then we were off to lunch. We decided to park at the Casting building and walk across the street to Downtown Disney until closer to our 2:00pm appointment. In hindsight, we probably could have checked if we were allowed to go through the casting process once we arrived, but we just headed to Earl of Sandwich and browsed the shops until 1:30. We arrived at Casting at 1:40pm and they did not seem perturbed by our early arrival. Casting was a giant blur of forms and lines. You'll need your program guide, your IDs, and your I9 form. You'll have your I9 form verified, your fingerprints taken, and hand your ID to a lot of people. The most exciting thing that happened was meeting with a coordinator for your department of work, which in my case was operations. They will go over your schedule for traditions, orientation, and training. I was scheduled for Traditions on Thursday, Magic Kingdom Orientation (Once Upon A Time Begins...Now!) for 9 hours on Friday, and Vacation Planner Core Classes for 8 and a half hours on each day Monday-Friday. I'm anxiously waiting for Traditions, when we'll get our complete training schedule, our cast member IDs, and our name tags! But next up: class on Wednesday.